There is always a lull every other month in blog posts. It seems it takes about a month for any project to be seen through to completion, because there are always a few different projects going on at once. So for a month I have nothing to write about because all I have are pieces of projects. Then within a week of each other, 4 to 5 projects are completed and posts come out rapid fire. We are in the lull, and in the next week or two the blogs will start to catch up. Earlier in July we were working on finishing all the surfaces (the last of the toxic work) so we could move back aboard and onto wiring/plumbing systems, when my mother asked if she could fly me home to visit for few days. While I was gone AJ's mind wandered from tedious surface treatments to the icebox. The icebox presents the following problems. #1. It's an icebox. It needs ice to keep things semi-cool. Where are we going to get ice? Why would we want to buy ice everyday? It could be plumbed as a fridge ... but #2. It's huge. The counter is chest height. I cannot reach the back cabinets due to it's depth, nor bend over and reach into it due to it's height. #3. The "wet locker" behind this counter is an inaccessible, uncleanable plywood lined hole that doesn't drain; not much of a "wet" locker, so therefore: #4. The wall between the counter and engine room was falling apart. #5. It's a massive amount of wasted space. It's mostly (wet) foam, not storage. 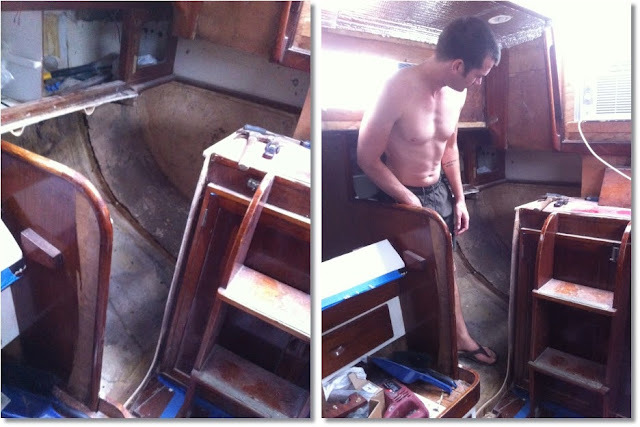 We had talked about all of this and considered alterations, like removing the icebox and foam and putting shelves in under the counter, but it didn't seem worth the trouble right now because the "problem" of wasted space isn't a real problem in terms of getting the boat ready to sail. So we decided to leave it be and maybe make changes in a year or two, somewhere else, if it's getting on our nerves. But while I was away AJ came up with a use for the space that made it worth the trouble: a navigation station. AJ messaged me about his nav station idea, I said "hell yeah," and he began demolition. A nav station means full demolition. Demolition is always easier than salvaging. If you're trying to save something and refinish or patch it, it's a hell of a lot of work. Destruction and building something new, is pretty quick and easy. Before describing the plan any further we should probably take a look at what I'm talking about. Here is the starboard side galley counter icebox. Notice also, the hole behind the counter. It's labeled in the floor plan drawings as a "wet locker", and while it does have hooks on the back wall, you'll end up raking all the water off of your jacket and onto the counter in order to get it back there.... and then the rest of the water just seeps into the plywood and foam insulation at the bottom. It stored chart tubes when we moved aboard, which makes more sense. Behind the varnished plywood wall by the companionway ladder was a thick fiberglass wall. He cut that out, dug out the foam, found another fiberglass wall and cut it out. Behind the second fiberglass wall was the icebox. There are 2 iceboxes. A previous owner had built another smaller icebox inside the factory way-too-big ice box. That explains the extra inch of counter height and the non matching countertop in this area. Below on the left is the smaller added icebox cut up and coming out. On the right is the original icebox fiberglass mold. 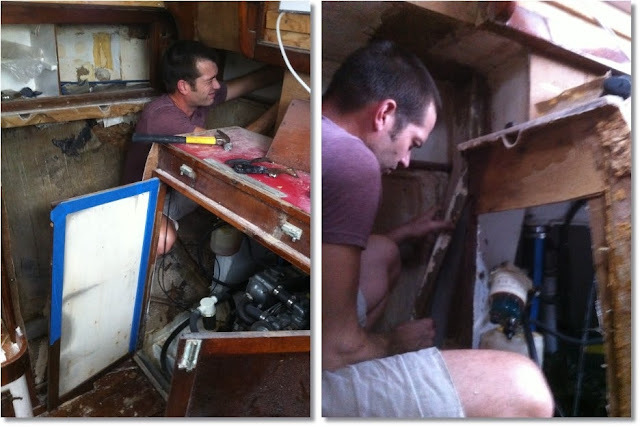 AJ removed the failing engine room panel, and the rest of the vent in the "wetlocker". It's reassuring to know someone else out there also found it inconvenient enough to warrant removal. Piece by piece over the course of many hours, This corner of the boat produced six stuffed-full lawn/leaf garbage bags of de-construction debris and two truck beds full of rotten plywood and fiberglass chunks. It seemed like an impossible amount of debris. By this time I was back from my trip home and AJ and I had to make two trips to the dump to get rid of it all. It will transform into a nav station by adding a bench where AJ is standing. And a shelf/counter top aft over where the wetlocker was to AJ's left. It will hold books and papers and nav stuff. A little table will extend and/or drop from the edge of the shelf. This still leaves a huge accessible well under the new shelf in the wetlocker area, And there is room for more shelves under the cabinets that are already built into the underdecks. Chart tubes can easily be stashed there. While the foam and glass dust was a mess, the hull itself is very clean. It will be an easy wipe-down and paint job. And a paint job is as far is it needs to be taken before moving aboard. We can build the little plywood bench box and shelves at any time, but we went ahead and got the dirty fiberglass cutting done while the boat is empty. It's still raining a lot. But since we're working mostly inside, it doesn't matter much. The clouds keeps the boat shaded and cool. I wish it would rain more to be honest! Because when it's not raining it's oppressively muggy, UV intense, and dead calm. And it's fun to wash the boat in the rain. I'm hoping the 40% chance comes through for me this afternoon. So you are going with no cold box of any type? We'll add a fridge of some sort eventually. We're looking at options. Whatever we get will probably go in the starboard sea berth area.